Gain immediate access to expertly designed professional development and collaboration resources. The unique tools our world-class experts developed and continue to improve will help you address the many challenging questions your role might be facing today and significantly enhance your ability to deliver maximum value to your organization. 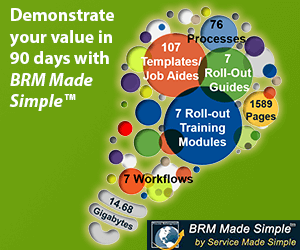 Download a personalized copy of The BRMP Guide PDF ebook (look for the “Download The BRMP Guide” button on the Online Campus Home page). Build your leadership skills through volunteer activities of the BRM Institute which will build your confidence, expand your knowledge, and influence, and expose you to new possibilities! Receive electronic copy of the BRM News, our bi-weekly publication containing valuable tips, interviews with expert BRM practitioners and consultants, and upcoming event announcements. To help interested members connect regardless of their location, we have replaced geographically rooted local chapters with location independent global virtual Communities of Interest. By now, we have several dozen of vibrant Communities of Interest facilitating member interactions based on a particular industry, geography, or interest. Join like-minded (and maybe not so like-minded) members who meet to discuss, collaborate, and share their insights in key areas of BRM knowledge and beyond.